Mark Zuckerberg's heart is bleeding in tiranga colours. 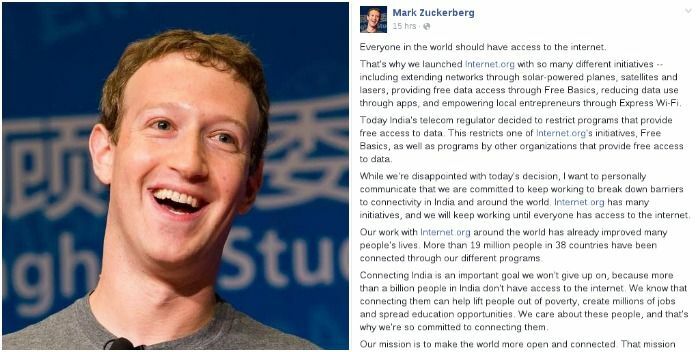 After TRAI rejected Facebook's Free Basics, rooting in favour of net neutrality, Mark took to his personal diary a.k.a Facebook timeline to express his anguish over the rejection. Days before Valentine's Day, the new daddy on Facebook seems to have lost the one love he really pined for -- India. Here's our re-reading of his Facebook post, with line to line subtext. Do you see it? Everyone in the world should have access to the internet. Subtext: Everyone falls in love. And so did I. That's why we launched Internet.org with so many different initiatives -- including extending networks through solar-powered planes, satellites and lasers, providing free data access through Free Basics, reducing data use through apps, and empowering local entrepreneurs through Express Wi-Fi. Subtext: That's why I tried so hard to reach you. It started with a Tinder swipe, to a Facebook post, then an email. I even reached out to your local postman, with a snail mail in hand. Today India's telecom regulator decided to restrict programs that provide free access to data. This restricts one of Internet.org's initiatives, Free Basics, as well as programs by other organizations that provide free access to data. Subtext: Today, you decided to sever all ties. You blocked me on Facebook, deleted my mails, burnt my letters. I have lost all access to you. While we're disappointed with today's decision, I want to personally communicate that we are committed to keep working to break down barriers to connectivity in India and around the world. Internet.org has many initiatives, and we will keep working until everyone has access to the internet. Subtext: While I'm deeply upset by this decision of yours to end things before they started, I am not ready to give up. I know how to convince you and I'll keep trying. Our work with Internet.org around the world has already improved many people's lives. More than 19 million people in 38 countries have been connected through our different programs. Subtext: Our love will never die. But you must let it blossom first. People have found love on Tinder before and across countries at that. So can we. Connecting India is an important goal we won't give up on, because more than a billion people in India don't have access to the internet. We know that connecting them can help lift people out of poverty, create millions of jobs and spread education opportunities. We care about these people, and that's why we're so committed to connecting them. Subtext: Connecting our destinies is my ultimate dream. And I won't give up on it. You don't see it yet, but this would be a wonderful healing experience for you. I promise. Our mission is to make the world more open and connected. That mission continues, and so does our commitment to India. Subtext: Our lives will collide one day. Of that I'm sure. Till then, I will wait. Don't worry, Mark. Bollywood gets you.